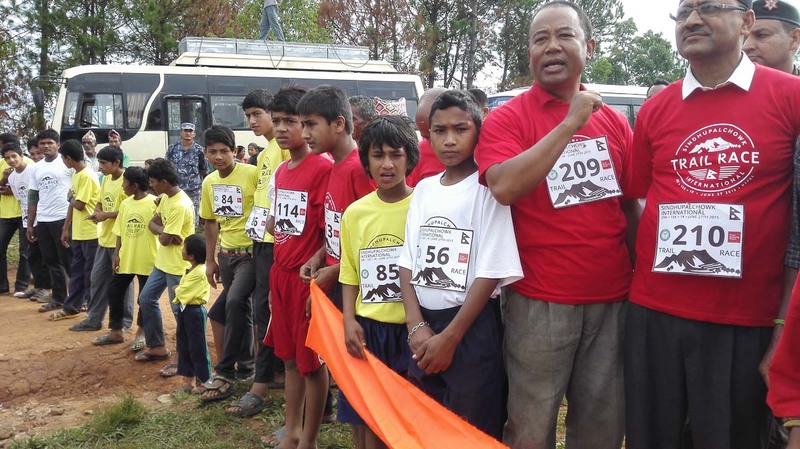 Sindhupalchowk hosted a trail race on Saturday 27th and it was a great experience. Buoyed by the news of Mira Rai’s race win in France the day before, some 20 foreigners and 100+ locals gathered to race. It started only about half an hour late, which is the price you pay for inviting dignitaries who are never on time. The honourable youth and sports minister came and blessed the event with his presence, and even competed in the 1km event*. Bravo! The three events were 29km, 16km and 1km. All well marked and on a nice mixture of jeep trails and single track. Some 150 people signed up for the events in total. The earthquake was felt hard in Thulo Sirubari: many lost their lives and thus many friends and family members; most lost their houses,food store & seeds, many possessions were lost or damaged and so on. Despite all the relief efforts, the community is faced with rebuilding itself, which for many is financially impossible. It’s so big and overwhelming. The race was one day only, two months after the earthquake, but it seems that it was something for everybody to look forward to, to work together to create, and to enjoy together. And everybody benefited from school equipment – reading and writing books, pens – given to participants, who ran to rebuild their schools. See below regarding the fundraising effort that accompanied the race. So how was the race? It was amazing. Way to hot, but very beautiful. The longer courses passed through forest, villages and fields. 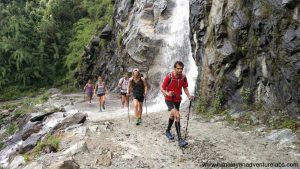 After a big descent to a river valley where people were harvesting their rice crop, a long, unending climb brought runners to a ridge-line dotted with villages. 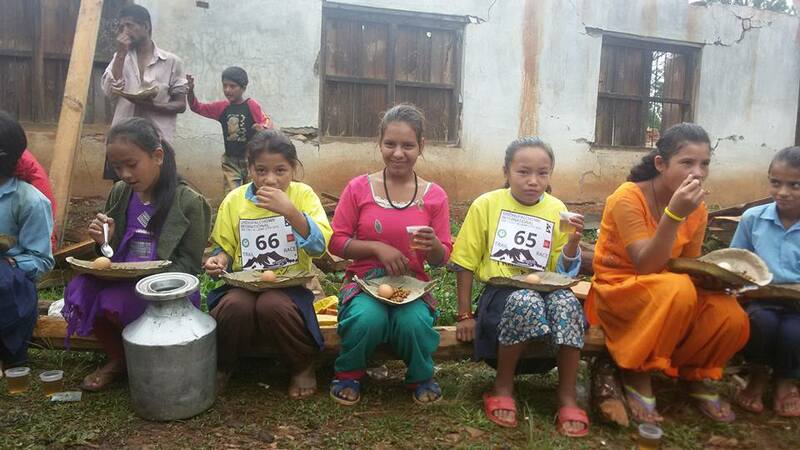 It was great to see that local community members had put out tables and made aid-stations for the runners. It was really nice. Of course it was heartbreaking to see so many flattened houses and people working hard to clean up, improve their temporary shelters, while doing hard work in the fields. It was good to know that the race was a focus for so much effort by Jimi, Jo and Ram to assist the schools in all the villages we passed through. A community organised check point on the 29km race. 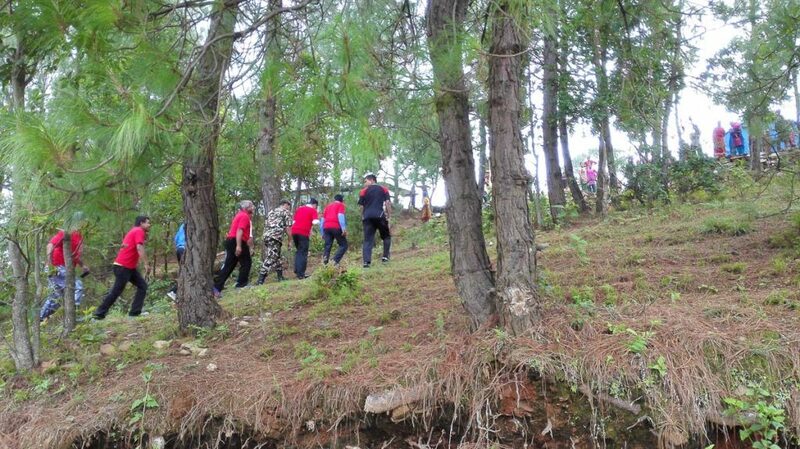 From a trail running point of view, let’s just take a moment mention Sunita Giri (15). Here she is below after raiding the 11km checkpoint. 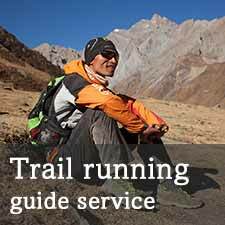 Almost everyone who comes to run in Nepal comments on Nepalis confidence on technical trails. It’s second nature. On the downhill to the checkpoint Sunita completely outpaced me in her sandals and colourful pants rolled up. Ram informs me that she has been training like crazy for the race. When collecting wood and water from down the hill she has been collecting extra and not stopping while walking back up hill. She came in first, and when she figures out her shoes size, we’ll make sure she has a pair of running shoes from the “sponsor a runner” funds and see how they work for her. Sunita, after raiding the checkpoint. We promised you that you could sponsor a runner, and that we’d send a photo of such a runner to you. Unfortunately, or fortunately, the start of the event was pretty chaotic and we got through 210 race numbers in a short space of time, and everybody crowded around to watch the process. Entry was 10 Rupees per person. Some adults entered just for the race number, and as the start happened, they were standing around chatting enjoying looking like racers but without racing. Participation is everything, even just the dressing up part! So we collect from a bunch of very generous people and the amount collected is below. The majority of this money is going into school uniforms. Many children still only have the clothes they were wearing on the day of the earthquake, and this is also why the race t-shirts were so popular. Minister’s entourage taking a very unsubtle shortcut after 100m. More images here from Hiro Shrestha. Thanks so much to all who supported the race. The event was a success and the village is still buzzing. Ram Puri who made this all happen with a vision of getting to work to make his home village better after the earthquake. With his great energy he brought so many people together to do great things, including this race. Ramsden Infants’ School in Barrow-in-Furness, UK raised $300 by having a “dress down” or non-uniform day. Sure those children will be delighted to know that their money will be going to buy new uniforms. The Trail Animals Running Club in Boston, USA held a fundraiser run for Trail Running Nepal and raised $1250 which has just been sent over to add to the cause. 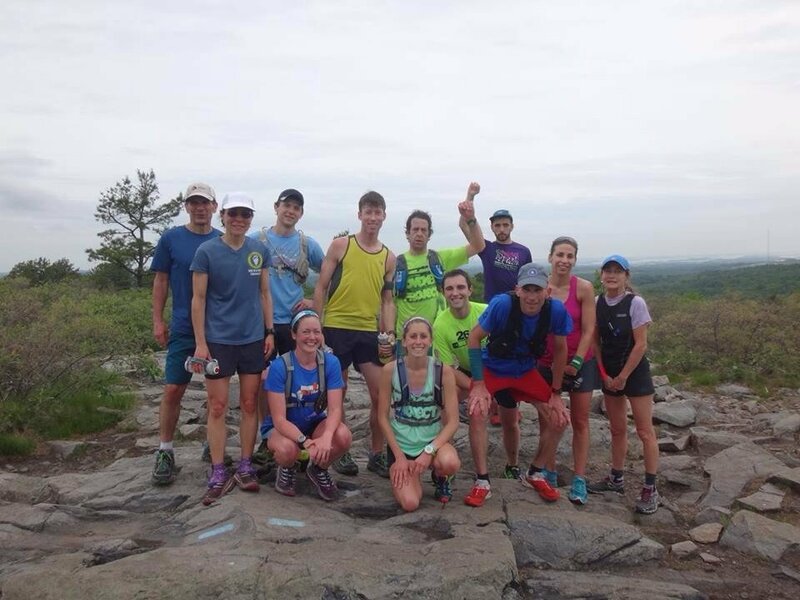 Thanks so much Yeti Runners. The French ambassador for coming and completing the full 16km event. Wow. Graphic Designer Tanja Cesh, designed a pro logo for the event which went on 400 t-shirts which gave the event a really pro-feel. Friends of Gone Running Hong Kong, and Tail Wind Asia who collected running equipment as prizes for runners and cash for Trail Running Nepal to support runners. Despite below, we’re going to use the TWA money for the two 16km runners who trained hard for the event. Sponsor a runner crowd. Yay! Our promise failed. We’re really sorry. The event was too popular and morning registration was fun chaos. We’re hope you’re happy to know that. Collected amount below. All of this will go to new uniforms. Mads & Claire at Himalayan Trails who lent us a generator and water filter. Very useful indeed, thank you and bravo! Thanks to Stephanie Lecat for water and bananas, some school materials and to Stéphanie Marquez for blankets, mats, mosquito nets and musical instrument for the village. And the big dal bhat! Of course thanks to the local communities for hosting the race, putting up checkpoints, supporting the runners. It made it a great day for everybody. Next year will be huge! Here are your donations after PayPal’s cut for it’s convenience. * Just in $141.20 from Julian in Japan, $18,92 Lily in the UK and $94,50 from TailWind Asia / John in HK. Plus $177.82 from Lizzy Hawker. Thanks to all of you! I think the total is now approx. $1080. I hear-by close this collection. * not all of the 1km was completed. See below. Minister’s entourage taking a very unsubtle shortcut after just 100m. Nice work everyone! Looks like great fun. I was hoping for a trifecta 🙂 Bring on the 2016 edition! Thanks Robyn – I had to look up Trifecta! Hope you’ll be back here soon.